"Paintings, released from the state of being made, arrive in language by indicating, the eternal dealing with them. The word is a place too, a district, in which they evolve." 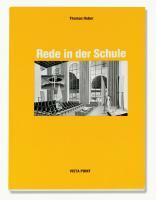 (Talk in the School), Vista Point, Cologne, 1986, 34 pages, 24 illustrations and 20 slides, format: 21 x 14 cm. 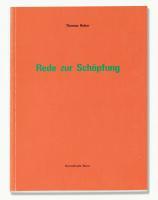 (Talk on Creation), Kunsthalle Bern (ed. ), 1983, 44 pages, 30 illustrations, 1 fold-out plate, format: 21 x 14 cm. (Talk on the Great Flood), Das Büro, Düsseldorf (ed. ), Düsseldorf, 1982, 48 pages, 26 illustrations, 1 layout drawing, format: 21 x 14 cm.